Cecilia Tan just completed Launch Pad, a science fiction writers workshop where authors take seminars with astronomers and astrophysicists to improve the science in their fiction. This is the first of two reports from the workshop. Space exploration was one of the Big Ideas that drove the progenitors of the science fiction genre. In more recent decades, advances in other disciplines have dominated, like genetic engineering and paleontology (Jurassic Park, anyone?). Jumps in computing and neuroscience spawned cyberpunk in the 1980s. But we always return to the mother ship, as it were, as the popularity of "planetary romance" a la Avatar remains constant, and the wonder of looking up and wondering "what's out there" is still a primal human activity. As it turns out, the past twenty years have seen huge advances in the field of astronomy and space exploration. Since many sf writers last took Astronomy 101 in college, Hubble has been launched, landers have reached the moon, and significant flybys of the solar system have taken place. How is a self-respecting science fiction writer supposed to keep up? One way is through the Launch Pad writers workshop, an annual gathering of the genre's best and brightest at University of Wyoming, convened by astronomy professor and novelist Mike Brotherton. Each year about a dozen writers can attend this NASA-funded "crash course" in astronomy. The idea is that if fiction writers could get the science right, the general public will be better educated about things like black holes, space travel, and so on. "Alien planets" have been a staple of science fiction from the very beginning, but until recently we had no actual evidence that planets outside the Solar system existed. Now we have irrefutable evidence that there are planets orbiting other stars. The Hubble Space Telescope and other advanced instruments have been able to detect the nearly indetectable wobble of stars caused by planets in orbit. 2. The moon was formed by a planetary fender-bender. 20 years ago three competing theories prevails on how Earth got a moon. Either the moon was formed at the same time as Earth, was captured as it passed by, or blooped or broke off. Well, turns out all three are wrong, and that only the Collision Theory explains everything we know about our satellite and our own planet (like why the Moon has no core and why the Earth is relatively more dense than expected). 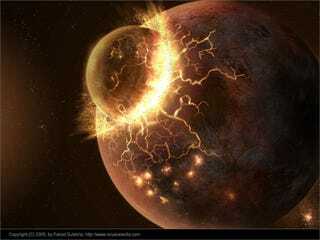 Computer modeling shows that a body the size of Mars struck the young Earth in a glancing blow, melting the planet and throwing off a heap of stuff. The original body was absorbed into the Earth while the stuff that was tossed into orbit coalesced into the moon. 3. Although our moon wasn't captured, Phoebe was. The capture theory isn't all hogwash, though. Phoebe, one of the moons of Saturn, was probably a capture for a number of reasons. For one thing, it spins the wrong way compared to Saturn's other satellites and for its size is quite unexpectedly distant from Saturn. The Cassini-Huygens Probe flew past Phoebe in 2004 and showed it likely to be a Centaur, an icy planetoid from the Kuiper belt, rather than an asteroid as some earlier theories ran, based on gainy Voyager photos. Pulp sci-fi and our own imaginations have always led people to think of Venus as if it were green, like a lush jungle. After all, we've been told it's hot and steamy there. But Venus has always been completely shrouded in an opaque atmosphere, so speculation was all we had. That is, until the Venera spacecraft landed on the surface. The lander lasted about 20 minutes before the intense heat got to it, but that was long enough to beam back photographs and other data showing for the first time that Venus is orange. Astrobiologists believe that anywhere water exists, there is the possibility for life. Until recently, though, we had no evidence that there was water anywhere but on Earth. Thanks to the Cassini-Huygens mission, though, we know that Titan (one of Saturn's moons) is rife with water and ice, including massive water "volcanoes." Cryovulcanism also occurs on Enceladus, another of Saturn's moons. A bit closer to home, there's water on Mars, and scientists were surprised to find water on our own Moon. Cassini is still orbiting arond Saturn, some Mars rovers that were supposed to run down years ago are still operating, and new missions are being planned all the time, so look for even more advances in space science in the next decade. Cecilia Tan is a freelance writer and editor. Read more about her experiences at Launch Pad on her blog.